Over breakfast this morning Mike and I realized that we hadn’t much time left to take advantage of our 10% off deals with the places that we registered. Since he may have a busy next few weekends, we decided to head to the mall today to hit up Williams Sonoma, Macy’s and Crate & Barrel, with gift cards from the wedding/Christmas/misc. in tow. Watching Mike try to shop just to shop was very amusing since he’s usually a man on a mission – he never just shops for recreation. So when the mission was to spend $x on un-predetermined stuff, he patiently wandered the stores and was actually disappointed when he saw that things were on sale (only my husband…). See, he’d made it his mission to completely spend the gift cards, and that was made more difficult when something didn’t cost as much (his logic was flawless). 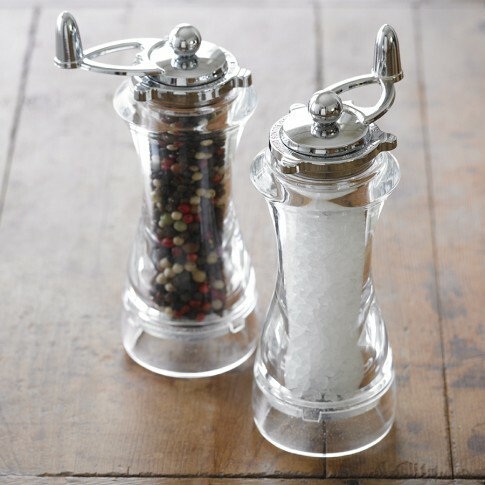 Photo from Williams Sonoma’s website. 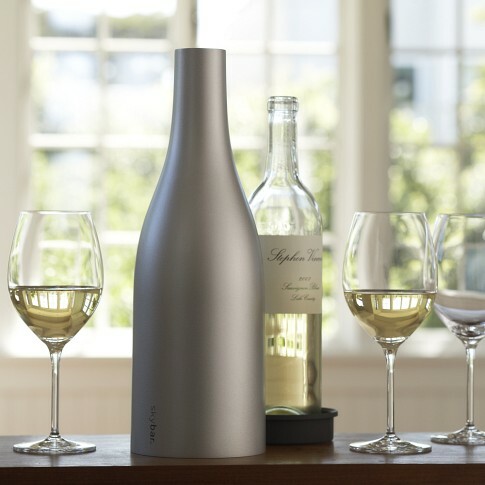 This is a wine caddy that keeps the wine inside chilled for up to 2 hours. Not only was this piece on sale, all sale items were an additional 20% off. So they were practically giving these away at around $10! Thankfully, we have pretty much everything that we need in the kitchen – or at least everything that we use on a regular basis, and then some. So walking through Williams Sonoma, we were purely looking for little luxuries. What we stumbled upon the wine caddy seen to the left. That barely made a dent in the dollar amount that we needed to spend, so we grabbed one and kept wandering. Unfortunately, Mike didn’t really like any of the table linens that WS sells, so that wasn’t an avenue that we could explore (you can never have enough table linens right?). He did spot some cheese tools and suggested those – but changed his mind when I reminded him that we’d received cheese tools for our wedding. 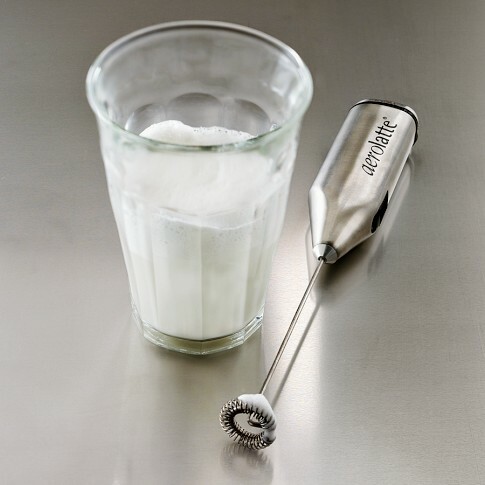 Photo from Williams Sonoma’s website. These were the salt and pepper mills that we decided to purchase. The automatic ones seemed excessive, and the one handed ones were too small to be practical. Photo from Macy’s website. 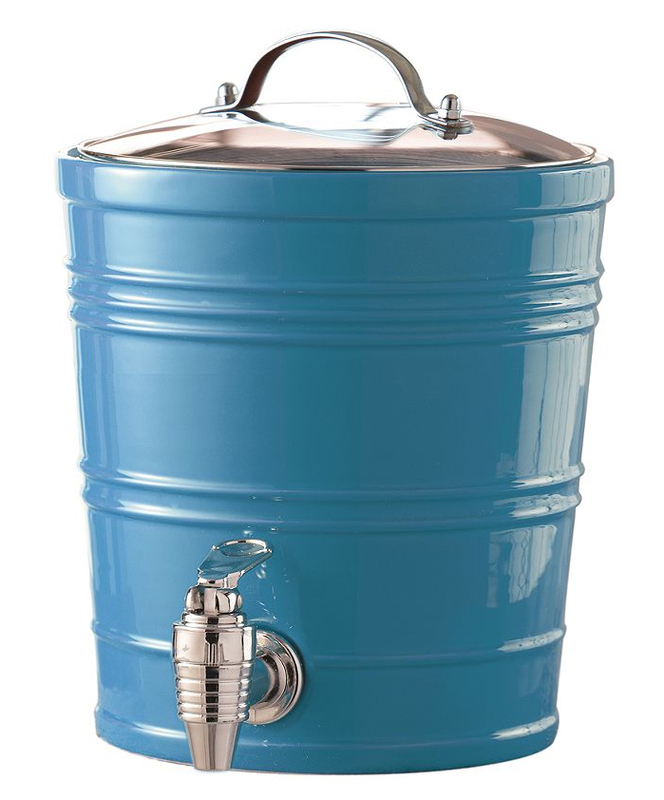 While not good for coffee, we got this beverage dispenser in a color that matched most of our existing Chirp by Lenox table linens. We figured we could use this both inside and out, and for a sale price of $25, it was a deal. When we got to Macy’s we thought we’d look for a coffee urn for when we’re entertaining. A sales associate informed us that it was no dice – they didn’t sell those. However we did find a fun looking beverage dispenser that Mike cursed for being 50% off. We had double to spend what we had at Williams Sonoma, so the hunt continued. It wasn’t until we found ourselves in the table linens section that a light bulb went on. 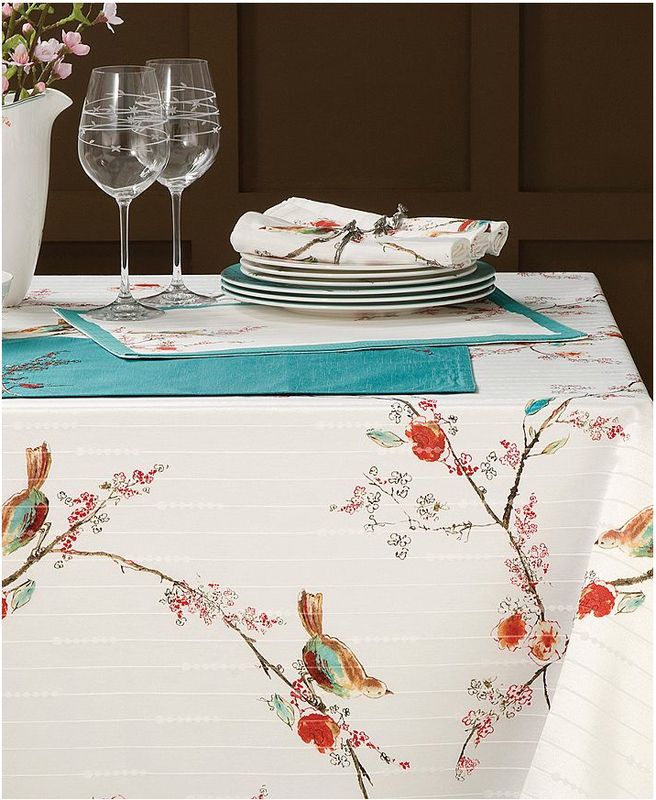 We have a few pieces (table runner and two different sets of cloth napkins) from Lenox’s Chirp collection, why not get more of those table linens, that would actually make sense. Wouldn’t you guess, those were on sale too at 30% off! We were able to get the spill-proof table cloth and 6 spill-proof placemats (oddly enough, while the table settings in that collection are super fragile and expensive, the linens are spill-proof and easily machine-washable). Photo from Macy’s website. The table cloth and two-toned place mats that we purchased today to continue our collection of Lenox’s Chirp line. Photo from Macy’s website. A two-tied cookie stand from the china portion of Lenox’s Chirp collection. Mike was excited, he thought we’d finally reached our limit at Macys… nope, there was still more to spend. 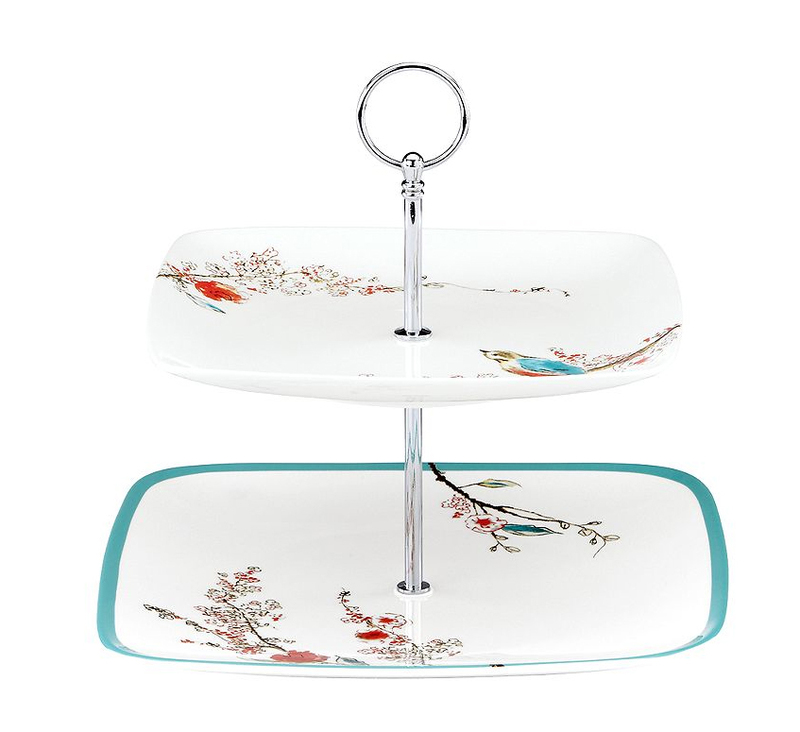 I decided that we should see if we could afford any of the actual china pieces from the Chirp collection (also on sale – we were on a roll today!) It was difficult to determine prices, but eventually we figured out that we could both afford and use the two-tiered cookie stand (perhaps for my delicious doughnuts…) The only ones left was the one on display or one in the back (we saw a note stating that on the display box) so Mike unassembled the display cookie stand with his keys and between the two of us we managed to pack it back into its box – there was much ripping of cardboard to make it fit and the extra cardboard was left behind. The sales associate at Macy’s seemed amused by our spend-the-gift cards mission and chuckled a few times at our dialogue. In the home stretch we headed over to Crate & Barrel to look at a china hutch that we’d been eying online. Unfortunately, it didn’t live up to our expectations, and neither did anything else in our budget. So it’s back to the drawing board there.